Accenture has, for the third time, been named “Best Employer of the Year” at the annual International ICT Awards Philippines, recognized for its industry-leading initiatives in developing talent, advancing inclusion and diversity, and supporting the welfare of its employees. Organized by the Canadian Chamber of Commerce of the Philippines and supported by the Information Technology and Business Process Association of the Philippines, the International ICT Awards Philippines recognize outstanding companies that have exhibited leadership and excellence in the local information and communications technology (ICT) industry. As a people-driven company, Accenture remains focused on developing and upskilling our workforce, enabling them to deliver innovative services to our clients in this digital age. The Best Employer of the Year award, which Accenture also won in 2008 and 2017, is given to the company that has showcased leadership in elevating employee potential and success by institutionalizing a talent-led approach that paves the way forward to a more diverse, inclusive and future-ready workforce. EMPLOYER OF THE YEAR AWARD. 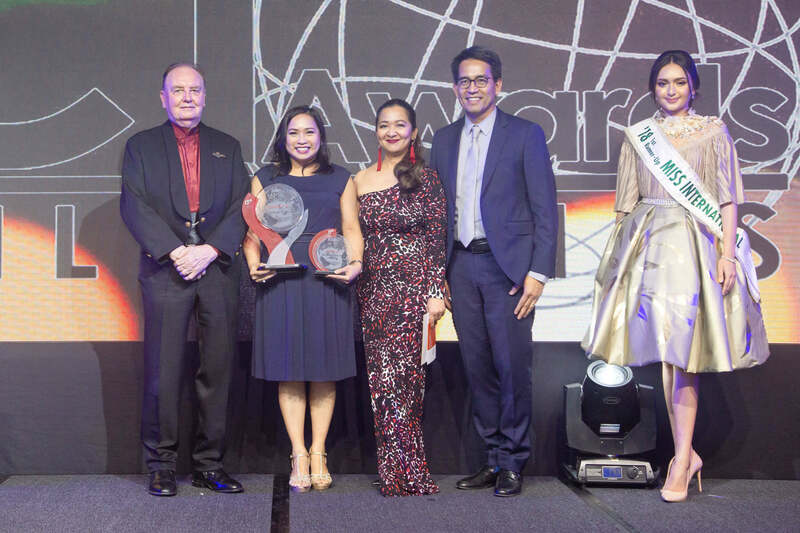 Sheryll Quito (second from left), human resources lead for Accenture Advanced Technology Centers in the Philippines, holding the Best Employer of the Year trophy from the International ICT Awards Philippines. This is Accenture’s third time being recognized for its employee-focused programs that help in the professional and personal development of its workforce. With Sheryll Quito are (from left to right) Julian Payne, president and CEO of the Canadian Chamber of Commerce of the Philippines and chairman of the organizing committee of the International ICT Awards Philippines 2019; Meanne Quiambao, vice president for sales of Globe Business; Peter Macquera, senior vice president of Globe Business; and Maria Ahtisa Manalo, Miss International 2018 1st Runner-up. “We are honored to be named Best Employer of the Year for the third time, reaffirming our leadership position in the local ICT industry and our commitment to building a community of innovators across our facilities in Manila, Cebu and Ilocos,” said Lito Tayag, country managing director for Accenture in the Philippines.